What do the last few general elections really tell us about support for the Labour and Conservative parties? It is strange to look back on recent years in British politics – filled with talk of hung parliaments, possible (and actual) coalition configurations, the impact and influence of ‘third’ parties, the decline of the two-party system, voter dealignment, and growing public scepticism and disengagement over the central features of the political establishment – and realise that the two biggest parties in the UK have actually had their level of support stabilise, and indeed slightly grow, over the last decade or so. One of the biggest long-term stories in British politics is that of declining support for the two largest parties. Aside from some particularly anomalous phases in the last 100 years of UK democracy – for example, the period in the early 20th Century where the Liberal party tore itself apart and was dramatically overtaken by Labour as a tenable party of government, or the moment in 1983 where Labour, challenged by internal divisions, surrendered enough support to the nascent SDP/Liberals to see that alliance win more than a quarter of the popular vote – the combined support for the two parties with realistic prospects of gaining commons majorities has never been lower. Fascinatingly, however, it seems that this is a trend that was reversed in the 2015 general election – and, on further investigation, declining support for the two largest parties may have already levelled-out, or even started to recover, as far back as 2005. I threw together the two graphs below – based on easily available vote share and turnout data – for a lecture I gave on Monday. 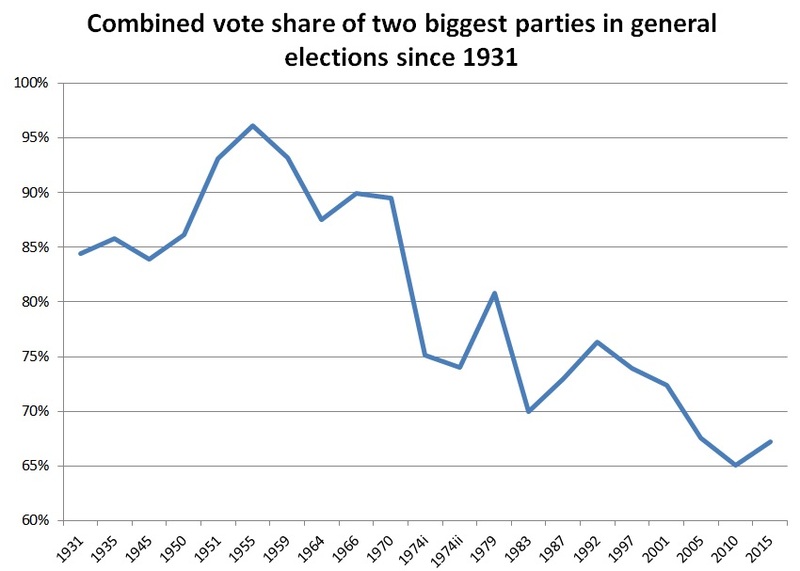 They show the combined Labour and Conservative vote share in general elections since 1931 and their combined share of the electorate (that is, their share of everyone eligible to vote) respectively. These graphs make the general direction of travel quite clear. Support reserved for the two largest Westminster parties fell dramatically over the course of the 20th Century. This is a well-discussed feature of the contemporary British political landscape – see, for example, David Denver’s compelling ‘dealignment’ explanation for the deteriorating connection between particular kinds of voters and specific political parties. What might be unexpected here, however, is that 2015 also saw a slight uptick in the vote share of the two biggest parties – this, in an election marked more than ever by the rise and recognition of ‘third’ parties, and the multi-party campaigning brought about by them. Despite the increased profiles of UKIP, Plaid, the SNP and the Green Party, it seems as if the declining fortunes of the Liberal Democrats was enough to contradict the general trend of dealignment from the two biggest parties. But the Lib Dem collapse alone cannot explain how, taking into account not only the voting electorate but the level of support achieved by parties as a share of the entire population of eligible voters, the dealignment trend appears to have been stabilised by 2005 and reversed in both 2010 and 2015. The idea that the aggregate level of support enjoyed by Labour and the Conservatives actually slightly improved in 2010 seems to contradict every major narrative about that election, marked as it was by the Liberal Democrats’ acquisition of around a million new voters after a successful election campaign and the subsequent hung parliament and coalition negotiations. So why aren’t we talking very much about the stabilisation (or even the improvement) of the vote share enjoyed by the two biggest parties? At least part of the answer lies with the deceptive nature of the 2001 general election, Blair’s second huge electoral success. While the vote share of the two biggest parties declined by less than 2% between 1997 and 2001, their share of the entire eligible voting population crashed by almost 10%, placing the combined electoral support base for the two biggest parties below 50% for the first time: where they have stayed ever since. 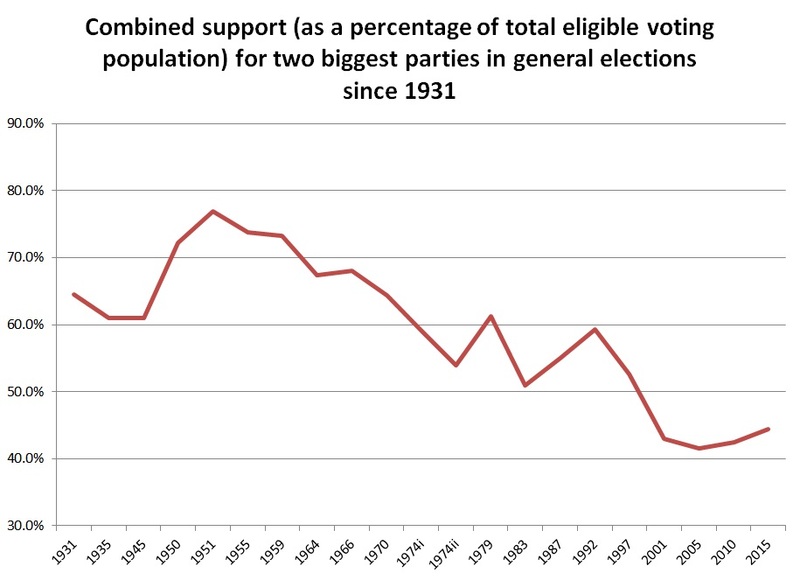 Our tendency to focus on vote share rather than electorate share – which takes into account fluctuations in voter turnout – made 2001 seem like a relatively good year for the managed decline of two-party politics in the UK rather than a stunning decline in support: a steeper drop than those recorded between 1992 and 1997 and between 1979 and 1983, when the rise of the SDP caused so much trouble for the then-established two-party norm. From the electorate share, we can see that the 2010 and 2015 elections represent something quite unusual in recent political history. These are the first two consecutive general elections to show an improvement in the electorate share of the two biggest parties since 1987 and 1992, when Labour’s fortunes slowly recovered and the nascent Lib Dems, confounded by the UK’s electoral system, incrementally lost the high vote share enjoyed by the Alliance in 1983. 2010-2015, 1987-1992 and 1950-1951 are the only three occasions since 1931 showing two consecutive elections of growing electorate share for the two biggest parties. It’s too soon to tell whether the combined vote and electorate share of Labour and the Conservatives will continue to grow in future general elections. These graphs show that the general trend of declining support has been interrupted before, and sometimes more significantly, than in recent years. And even if overall support for the two biggest parties is set to continue rising in the coming years, there’s no escaping the brute fact that it currently still sits at a nearly historic low point, with less than half of the electorate endorsing one or the other of Labour or the Conservatives. However, there is enough here to at least begin to argue that the haemorrhage of support from the two biggest parties has now been halted – and to develop a set of possible explanations as to why this could be the case in an era of chaotic and dealigned politics. Rumours of the death of two-party politics may yet prove to have been greatly exaggerated. Here’s a quick graph that I threw together for a lecture I’m giving tomorrow, based on aggregates of the latest polls and seat predictions (all garnered from the excellent May2015 website). Click for a bigger version! The back row of columns represents a reasonable guess of the real distribution of seats, based on the latest polls, within our current First Past the Post system. Specifically, it makes use of the May2015 Predicts totals, which is a good model, incorporating the ‘strong transition’ equation as well as data from Ashcroft’s polling of marginal seats. The front row of columns, meanwhile, shows a seat distribution that assumes simply that the aggregate of current polling is accurate and that each party’s nation-wide support level is translated directly into proportional Westminster seats. This would be the outcome under some variant of a ‘list’ electoral system, and would be close to the outcome under STV (depending on how that system would be implemented). There’s lots to talk about in this graph, just as there is for so many comparable images based on the outcomes of past elections. Regionally-bound parties like the SNP would clearly have less nation-wide power under a proportional system. Parties with meaningful levels of support that are quite widely distributed would do better. How resilient the Lib Dem MPs would be under a more proportional system! 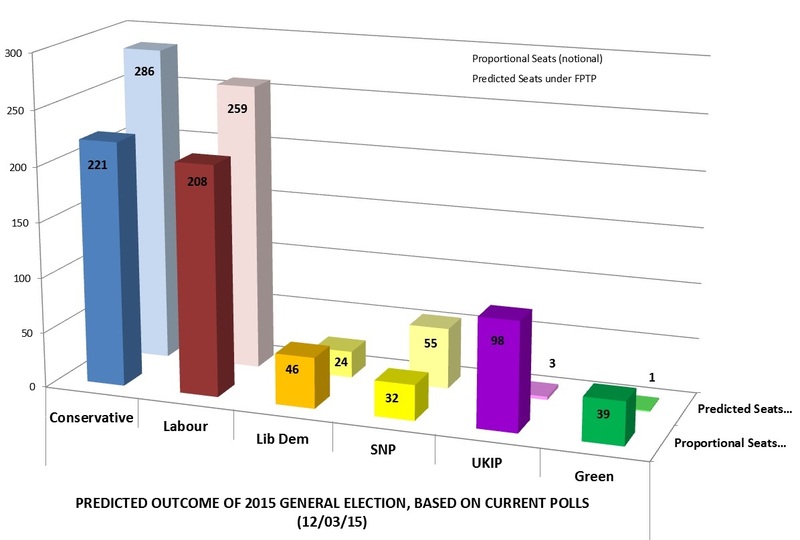 How significant UKIP would be for everyone’s post-election coalition mathematics! How much more seriously we’d have to take the Greens! But the real headline – and the thing that is made most immediately and obviously visible by illustrations such as this one – is the changing size of those first two red and blue columns. 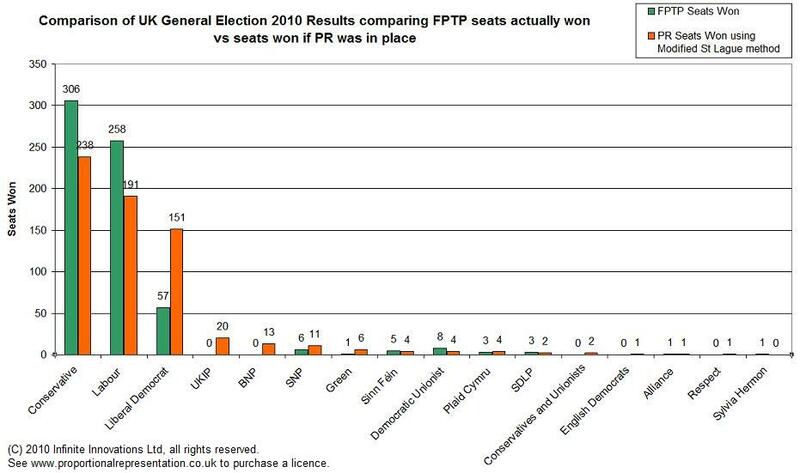 The two parties that will necessarily be involved in every future government are also the two parties with the most to lose from a more proportional voting system. This doesn’t add up to a substantive argument about the value of proportionality of representation. But I don’t think we need to look any further if what we want is an explanation of the failure to make meaningful reforms to FPTP, and the gloomy prospects for such reform efforts in the future. George Orwell had a problem with utopianism, and did not reserve his scorn for the idealists of his own era. One of my favourite of his essays is his excoriating 1946 analysis of Jonathan Swift’s Gulliver’s Travels. Swift’s remarkable work is fantastic adventure, an exercise in unreliable narration, and a work of satire. It spoke volumes about Swift’s own perspective on politics. The utopian component of the work is introduced with his descriptions of the imaginary ‘Houyhnhnm’ society – a civilisation of sentient horses, embedded in their natural context but plagued by the aggressive ‘Yahoos’, who turn out to be thuggish humans. In the book, the contrast between Houyhnhm and Yahoo society forces Gulliver to question his assumptions about the moral advantage of humans over nature. [P]ublic opinion, because of the tremendous urge to conformity in gregarious animals, is less tolerant than any system of law. When human beings are governed by ‘thou shalt not’, the individual can practise a certain amount of eccentricity: when they are supposedly governed by ‘love’ or ‘reason’, he is under continuous pressure to make him behave and think in exactly the same way as everyone else. The Houyhnhnms, we are told, were unanimous on almost all subjects. The only question they ever discussed was how to deal with the Yahoos. Otherwise there was no room for disagreement among them, because the truth is always either self-evident, or else it is undiscoverable and unimportant. They had apparently no word for ‘opinion’ in their language, and in their conversations there was no ‘difference of sentiments’. They had reached, in fact, the highest stage of totalitarian organization, the stage when conformity has become so general that there is no need for a police force. Swift approves of this kind of thing because among his many gifts neither curiosity nor good-nature was included. Disagreement would always seem to him sheer perversity. ‘Reason,’ among the Houyhnhnms, he says, ‘is not a Point Problematical, as with us, where men can argue with Plausibility on both Sides of a Question; but strikes you with immediate Conviction; as it must needs do, where it is not mingled, obscured, or discoloured by Passion and Interest.’ In other words, we know everything already, so why should dissident opinions be tolerated? The totalitarian Society of the Houyhnhnms, where there can be no freedom and no development, follows naturally from this. Orwell is arguably being too harsh on Swift here, who comes across as firmly sceptical about rationalistic or utopian projects elsewhere in his works. It’s far from clear that Swift means for us to admire every aspect of Houyhnhnm society, but rather to draw his readers’ attention to the pathologies of his era – discrimination, racism and anthropocentrism. Orwell’s conclusion that Swift’s entire world-view “only just passes the test of sanity” therefore comes across as one blow too many. But the critique that Orwell levels raises an important question for contemporary political theory: how many of us find something to long for when we read about the consensus-driven society of the Houyhnhnms – and how right are we to do so? A Crisis in British Democracy? Prompted by an intriguing question from a colleague, I just found myself in the position of trying to set out, in one paragraph, the big overarching theme from all my lecturing and teaching on British politics. I kind of didn’t manage it, but I think that my failure may be an instructive one, and the theme I did draw out makes a certain amount of sense: contemporary democratic crisis. The unspoken overarching question … is “Is there a crisis in British democracy?”. To begin to answer this question, we have to draw upon a multitude of core trends from recent years: voter dealignment, sovereignty debates, regional nationalism, single-issue parties, electoral instability, political scepticism on the part of the public, conflict between formal and informal elements of the establishment (media vs. politicians = good example), the rise(?) of executive presidentialism, etc. Each of these topics could form the basis for a blogpost (or journal article. Or book. Or book series) in their own right – and perhaps they will. But we might sketch out how each of these vaguely-drawn headings contribute to the sense of a broad crisis in British democracy. Voter dealignment is a hugely important trend in contemporary politics, convincingly framed by David Denver and others. In the UK context, it incorporates the effects of the decline in class-motivated voting, a long-term pattern that was powerfully concretised by the New Labour project and its rejection of most of the ideals usually associated with a politicised working class. We are now, as a voting public, far more likely to be ‘floating voters’ than before, far less likely to maintain political and party memberships, and increasingly disinterested in emulating the voting tendencies of our parents. Economic social mobility may be rather stagnant, but political mobility remains alive and well among voters. Our dealignment from the classic duopoly of British political culture contributes to several other trends. So-called ‘single issue’ parties are now successful enough to need to set out more broadly-framed governmental manifestos (often with mixed results), meaning that UKIP isn’t just interested in immigration reform and EU membership, but also needs to have a perspective on education and the NHS that is at least somewhat plausible. Combined with the rise of regional nationalist parties – primarily meaning the SNP, given the strangely dwindling fortunes of Plaid Cymru in Wales – voter dealignment clearly hasn’t simply resulted in more variation in party support, but in the awakening of the UK as a venue for a multitude of political perspectives and parties. This rise in ‘third’ parties is of crucial importance even in the face of the Liberal Democrats’ declining fortunes. With significant upticks in support for UKIP, the Green party, and the SNP, combined support for Labour and the Conservatives is at a historic low. Of course, when we talk about the changing tendencies in party support, what we’re really trying to understand is the changes in voter behaviour more broadly. Political scepticism and political apathy are powerful forces in our democratic landscape. Electoral turnout crashed significantly in the early-mid 1990s, and has only recovered a little bit since the end of the Blair years. While the importance and efficacy of voting is generally considered to be non-negotiable in most democratic contexts, there exist good reasons to doubt the meaningfulness of democratic participation in this country – and it’s telling that such scepticism seems, more and more, to be at the heart of our national debate, with various movements claiming (or being accused of embodying) an ‘anti-politics’ agenda. Various recent events have contributed to declining public confidence in the institutions of British democracy even as they form part of what many commentators perceive as being a generalised crisis in the support-base for established liberal democracies worldwide. Meanwhile, the crisis in British democracy – if there is one – is surely reflected in the mounting tensions between the various core institutions and components of the establishment in this country. This is a democracy where the printed media claim to influence the outcome of elections even as their circulations decline and the political class seeks to introduce press regulations. The police are constantly at odds with political will at a personal and institutional level and the NHS is alternately revered and delivered to play as a viable political football. This is a short list, and a badly incomplete one, but it gives some sense of the scale and rapidity of the trends that are reshaping British political reality. Now, more than ever, British politics is in need of a clearer understanding of its own democratic theory. Even before the emergence of the economic crisis in 2007, the idea that inequality is itself responsible for the worst excesses and deepest failings of the UK’s financial sector had become rather well-trod. Stewart Lansley produced Rich Britain in 2006, and for a more gossipy version of many of the arguments presented in Lansley’s book one might turn to the BBC Business Editor Robert Peston’s 2008 effort Who Runs Britain? And Who’s to Blame for the Economic Mess we’re in?. Here too, as in The Cost of Inequality and Rich Britain, is the staggering parade of statistics to tell us just how rich the very richest have become, and Peston implies (though never quite states outright) that these ‘super-rich’ hold much too much of the power in contemporary Britain. Another interesting thread to be found in both books is the slightly shocked reflection on New Labour’s fostering of highly concentrated mega-wealth in the UK; both books remind us of the mindset that lay behind Peter Mandelson’s statement that he and his party were “relaxed” about people becoming “filthy rich”. The difficulty here is in connecting an intuitive distaste for large-scale inequality – connoted so clearly by the phrase filthy rich – with the features of our economies that contributed to the financial crisis. The correlation is easy to point out, and Lansley claims to be undertaking a somewhat different project from the authors of The Spirit Level, which set out the correlations between equality and desirable societal outcomes so clearly. How, then, does Lansley approach this territory – does he succeed in his apparent aim to move from correlation to demonstrated causation – and what does he offer that’s new? The Cost of Inequality sets out a brief history of the British financial sector, building to a contemporary model of capitalism where, as he pithily puts it in his introduction, “deregulation has created the opportunity to make money, big money, not by being smarter, or by taking the long view, or by investing in new systems, but by a number of new business practices that manipulate the financial structures of existing firms.” At this point lies the crux of Lansley’s argument. With stagnating real incomes for the vast majority of people – a “consumer society without the capacity to consume” – the gap was filled by extraordinarily cheap credit. Meanwhile, the “flush personal bank accounts” and “apparently compulsive obsession with building ever larger personal fortunes” created the context and motivation for increasingly risk-prone behaviour within the finance sector. This is a compelling narrative, if well-rehearsed. It is at least partially dependant upon cultural and psychological assertions (as so often economic arguments must be): an atmosphere of security and a feeling of “triumphalism” contributed to the behaviours that led to the crash. The argument is also plausible, and quite worldly. Lansley states that “[o]f course, any finance system needs the freedom to take risks to innovate and invest”, and points to the competitive innovations of technology giants as an example of capitalism done right. What seems to be missing from this account is an in-depth consideration of the importance or effectiveness of government action in relation to the financial crisis. Many have argued that the first Basel Accords created a regulations-based incentive to over-invest in mortgage-backed bonds (see, for example, Friedman and Krause on this topic). Governments also moved to cement the culture of ‘too big to fail’ by bailing out the worst-hit banks, with a very few exceptions. Interesting counterfactual questions ought also to be asked as to the effectiveness of the various stimulus packages deployed by the UK and USA. If Lansley could tackle such considerations directly, the result would be a more compelling argument for his preferred end of greater state intervention in the finance sector. As things stand, we are given a relatively clear picture of the failings of the current system, without any clear indication that a more regulated alternative would necessarily be preferable. This is an edited preview version of my review of Stewart Lansley’s 2011 book, The Cost of Inequality. The rest is available on my academia.edu page. An Outside Context Problem was the sort of thing most civilisations encountered just once, and which they tended to encounter rather in the same way a sentence encountered a full stop. We’re used, by now, to the stories. Story 1: Democracy is built in a way that means that it’s too short-termist in its thinking, incapable of taking slow-burn projects or problems seriously, happy to accept unknowns and uncertainties as long as this administration doesn’t have to deal with them. Tethered solely to the populist demands of election and re-election seeking, our representatives lack incentives to engage with the problems that are starting now but could become hugely impactful a little further down the road. Story 2: Blinded by self-interest, or just our inability to imagine influences from beyond our usual sphere of experience, we fail to foresee the huge exogenous issue until it’s too late. 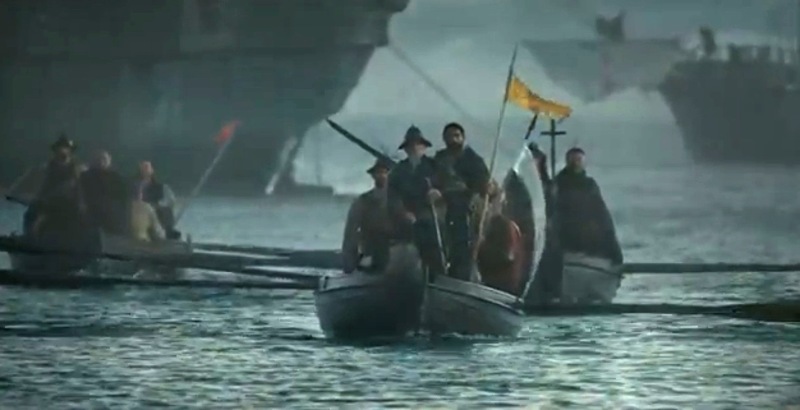 It’s the scenario that we see occasionally in the movies – A big spaceship turning up in Independence Day, a rogue planet looming in the sky in When Worlds Collide, the Spanish boats bringing Catholicism, plague and cannon to the new world in Apocalypto. What connects these stories? Both of them entail the claims about the dangers of our limited epistemic perspective. Story 1’s short-termism is marked by our failure to comprehend the future implications of emerging problems (or our failure to care if the likely implications of such problems will be some future generation’s headache). In the end, it boils down to our response to risks, our comfort with unknowns and unintended consequences when their impact will be felt by people other than ourselves. Story 2 removes the possibility of present-day intervention from the equation. Our ignorance is total, because the universe is serving up a curveball. While in story 1 we are ignorant of the ramifications of current trends (and lack incentives to invest our time and resources in evaluating their risks and responding sensibly to them), in story 2 we have had no opportunity to predict or prepare for the problems at hand. Such scenarios loom large in our cultural consciousness, as a trip to a cinema or book shop can demonstrate. They are Rumsfeld’s unknown unknowns, Taleb’s black swans, Banks’ outside context problems. Democracies are generally thought of as being especially vulnerable to problems like these. They may actually magnify human short-termism. There’s something natural about short-term thinking – human beings are lucky if they even get close to living for 100 years, and it may be relatively unreasonable to expect them to give a stuff about the possible state of affairs in hundreds of years’ time. But democracies don’t operate by human generations – they operate by political generations, terms of office. They shorten the scope of possible human foresight and long-termism even further than our biology does, so that issues spanning political generations, and not only actual generations, become someone else’s problem. With random events, or events that cannot be anticipated, the emphasis shifts to the survivability of democracy. David Runciman views the robustness of democracy as a kind of puzzle, and a potentially dangerous one: by successfully surviving challenges, it has established a “confidence trap” which causes us to think of it as safer and more stable than it really is. When the big, unforeseeable challenges of the future come knocking, he argues, democracy will be in real trouble – we will be clinging to a form of social order that we imagine to be the most robust imaginable, but which cannot possibly protect us from a real shock to its system. In my mind, the cost was ridiculously low … given that this plan would eliminate the most serious threat to the rich world in this century. In spite of this, a vast majority of Norwegians was against this sacrifice. To be frank, most voters preferred to use the money for other causes – like yet another weekend trip to London (or Sweden) for shopping. [T]o install enlightened dictatorship for a time limited period in critical policy areas. Like the Romans did when the city was challenged. And which is the solution currently pursued by the Chinese Communist Party, with obvious success in the poverty/energy/climate area. But I agree that the obvious solution of strong government appears unrealistic in the democratic West. The fact that this “obvious solution” is unlikely to be implemented speaks to the possibility that desperate times call for desperate measures: like Runciman, he is arguing that there are certain situations where democracy is not up to the job, and something (or someone) needs to step in. 1. Short-termism revolves around knowledge problems, just as outside context problems does. If we knew with real certainty that a given current trend is going to turn into an existential threat, it is likely that even a short-term political establishment would find means to address or mitigate it. Such certainty is hard to come by, because the future is, by definition, unknowable. 2. These two types of problems intersect in another important way. One of the reasons we might doubt that a current process will turn into an existential threat is our faith in human and technological innovation and progress. In this way, outside context benefits – the good things we cannot yet imagine – are often imagined to dwarf the threats of current trends. 3. Why do we imagine that democracy is worse than other types of social order for dealing with big problems? This assumption – that democracy goes hand-in-hand with complacency and softness – has been on the agenda since classical civilisation. But anyone who argues, like Randers, that some kind of dictatorship will outperform a democracy in confronting a big problem like climate change is making extraordinary assumptions about the way that knowledge is distributed in society. The possibility of an epistocracy – rule by the knowers – revolves around the idea that there really is some subset of a population that knows better than the rest. While it may be plausible that such a subset exists, it is deeply implausible that we are capable of recognising it when we see it. Willingness to act in the long-term interests of a species does not necessarily imply that we understand what those interests really are. Democracies already take steps to ensure longer-term institutional memory and agency – this is why the UK civil service stays much the same year by year, while different administrations come and go. And when an outside context problem comes knocking, there are good reasons to expect a democracy to be more robust than other kinds of social orders – as shall be discussed in future posts. But a big, unexpected problem will have little respect for the long-termism of a benevolent dictator who is necessarily bound by the same epistemic limitations as the rest of us. The usual example given to illustrate an Outside Context Problem was imagining you were a tribe on a largish, fertile island; you’d tamed the land, invented the wheel or writing or whatever, the neighbours were cooperative or enslaved but at any rate peaceful and you were busy raising temples to yourself with all the excess productive capacity you had, you were in a position of near-absolute power and control which your hallowed ancestors could hardly have dreamed of and the whole situation was just running along nicely like a canoe on wet grass… when suddenly this bristling lump of iron appears sailless and trailing steam in the bay and these guys carrying long funny-looking sticks come ashore and announce you’ve just been discovered, you’re all subjects of the Emperor now, he’s keen on presents called tax and these bright-eyed holy men would like a word with your priests.